Where did my YEARS of issues go? No longer have access! Disaster. Have been collecting issues on the app for several years...and now they have all disappeared. What the heck? This is a disaster. The new interface wont work on older ipads and if you want to borrow someone else's ipad in your family to read the magazine you paid for, you cannot. Basically the publisher has locked you out and stolen your money, congratulations, you have been scammed. Love the print version, but the app? No. There was a mixup with my print subscription after I signed up at Vogue Knitting Live NY in January & the delay had me miss my first issue. The issue was later resolved, but now I’m unable to to logon to the app. It tells me my subscription is expired and/or they don’t have me email address on file. I can’t even look at the current issue which is still part of my subscription. If an app could be considered rude, this on would be it. I’m a member of Vogue knitting ,for over 20 years . I look forward to every issue. I bought a physical copy and a digital copy of a past issue. I have an active subscription to the print magazine. The app hasn’t worked for awhile. Now I have to purchase a subscription to access the digital content I already purchased? If I wasn’t half way through the project I would delete the app. As it is, this is the last Vogue Knitting project I do. You don’t get to sell subscriptions to digital content previously purchased outright. I will be reporting this to Apple and anyone else I can find. GET IT TOGETHER VOGUE APP!! THIS AP IS RIDICULOUS. I SUBSCRIBED TO BOTH THE MAGAZINE AND THE AP, AND IT HAS BLOCKED ME FROM USE. VOGUE MAGAZINE HAS NO PROBLEM TAKING MY CREDIT CARD BUT HAS NO SUPPORT WHATSOEVER. THE AP SAYS "CONTACT US" YET LEAVES NO WAY TO CONTACT THEM!!! ITS CRAZY!!! HIRE SOMEONE TO FIX THIS AP, WE ARE KNITTERS AND WANT A WORKING AP FOR GOODNESS SAKE!!!!!! I absolutely love having inspiration and information right there— in the yarn shop, waiting in line, midnight moments. Having the pattern always there is such a luxury. Thanks, Vogue. I always go to this magazine to see the latest in yarns and colors. They have great designers for their patterns. This Is The WORST App EVER!!! VogueKnitting is a great magazine but the current platform they are using for their digital subscription is the worst. I am experiencing the same problems as the other subscribers. I don’t have access to the older issues and my email address doesn’t exist. The app was updated 6 days ago and I don’t recall seeing it listed as an update on my device. The recent update required me to download the remaining magazines I have access to AGAIN! Obviously the tech support doesn’t care if you’re experiencing a problem with this app. I wish I could give this app a quarter of a star. This is my second review since VK moved to this platform, the first one was deleted. I don’t know how or why they changed this app. It is easier to maneuver but so unwieldy! Can’t even mark favpages and still can’t print. Awful. My subscription just renewed, and I can’t download the current issue, much less my previous purchases! Vogue, I just cancelled this subscription, although I realize I won’t get my money back. This hideous app has just lost a subscriber, and most likely a reader, for you. Ugh!!! Thanks for nothing. Agree completely with previous review. This is a hot mess and a complete waste of time. I’ve contacted tech support to get in but that was temporary. Left email and phone messages asking for help. Nothing is ever returned. Says I’m already registered but won’t let me access even with temporary password they provide. Won’t let me register as new user. Horrible customer service! August 1, 2018. The app was updated. Still doesn't recognize my email. Previous review... My online account knows who I am and when my subscription expires but this app won’t let me login. I just get an error message saying my email can’t be found. I have been a subscriber to Vogue Knitting since the 1960’s and have EVERY issue. Was so excited when I was able to do things easily. Another case of let’s fix it till is BROKE and DOES NOT WORK!! I can no longer print my pattern to work off of and write notes... what’s up with that. Apparently whoever the brain trust is behind this app is not a knitter! Wow. Everything I need to keep on top of the world of knitting. Love that I can keep track of what VK Lives are happening. It is quite annoying to lose all downloads every time there is an update. I lost all my old magazines and I did need them for a long overseas trip. App stopped working. Please let us know when there will be a fix. I am only able to access my current subscription of magazines and not subscriptions from the past even though my account is the same. Difficult to navigate the patterns and select specific pages for downloading. Lost access to paid magazines THIS IS A RIP OFF! I have been subscribing via this app for years and am unable to access the many magazines I paid for. One minute access is unacceptable. If I could give this app NEGATIVE 5 stars I would. They held my subscription hostage until I updated to the latest version of the app and now I have ZERO access to ALL of my magazines. I want a refund for every year I’ve subscribed to Vogue Knitting. Worst. App. Ever. Extremely unhappy customer!!! For the second time previous magazines that I had purchased in the past have disappeared when upgrading this app. I would not recommend this app. Any knitter or crafter realizes how serious an issue that is. I respect the effirt to protect the material, but i need to be able to print the instructions and write notes on the document! You cant print it. You cant email it. You cant transfer it. This app is useless at tge moment. I think i will let my subscription expire and buy piecemeal paper copies as needed. I have to agree with other bad reviews. I would give a negative rating of I could. I used to love the ease of access to past issues and being able to send myself a single pattern. I've had issues with this app the last couple of years. This latest update is pitiful. When you tap on the article there's a black screen until you tap on text. The instruction section is not layed out well, with each pattern flowing into the next?! I'm considering not renewing, but afraid I'll lose past subscriptions. I cannot retrieve my magazines. Terrible tech support! Update June 7, 2018: I finally retrieved my magazines NO THANKS TO TECH SUPPORT AND THIER TERRIBLE RESPONDS! Soho Publishing is the one who was helping me and responding. Basically nothing was coming from TechSupport. Now to the app. Because of it I decide that for the next issues I back to print. You can tell these people don’t understand magazine apps. 1st; To get to my 2010 issue I have to scroll through every issue from the most recent 2018 issue. There is no search or group issues page. 2nd: you cannot bookmark and I lost all my bookmarks from the old app developer. There is a lame icon they call a bookmark but it is not in the older issues AND you have to remember what issue the bookmark is in. There is not a list of all your bookmarks together from all issues. Right now I am dealing with it and glad I have my magazines back no thanks to the developers. I loved the old app so much better. Or better yet let Zinio take over . They are great! This new updated app and lack of support is terrible. I have not been able to retrieve my magazines with the update . I have e-mailed tech support 6 days ago with no responds. Terrible tech support. 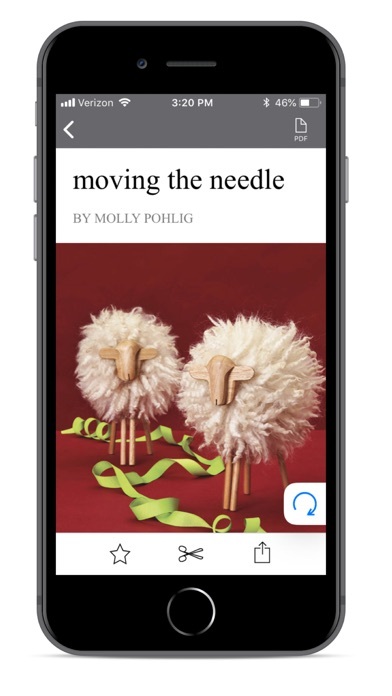 I have been a faithful subscriber to Vogue Knitting since the 1990 and used the app since they started and now I am very disappointed . I guess my relationship with Vogue Magazine has ended. I am back to Rowan Magazines. Update: I had put my name in and ZIP Code and it says invalid subscriber.. Do you not read my emails? You are the worst tech-support I’ve ever ever dealt with. We’re talking two weeks from the time I have contact with you. I have magazines from 2010. Just tell me how to retrieve them!!!!! Downloaded the latest edition just fine, but the bottom of the magazine pages are covered with the ‘slides’ of all the pages. The bottom part of all the pages are inaccessible to read. Please fix. Thank you Vogue Knitting! Everything I need all in one place! Well, I just downloaded the update, very hopeful that all of the issues with VK’s awful app have been resolved. Nope. Now with this version my email and password are unrecognized and I am being asked to pay $5.99 to download copies of issues I already own. I have been a loyal VK print and digital subscriber for 15 years. I’ve put up with all the app shenanigans hoping they would resolve things. But now, being told that I do not have an account and that my email is not valid just. makes. me. angry. More and more I think that VK is sorely behind the times and I’m thinking of canceling my subscription and only supporting independent designers on Ravelry. Enough is enough. I love the new app! Thank you for making the change. I feel the same. For 27$ you can have the printed and the app included. However the reverse cannot not happen because customer service is not really interested in customer service. Based on their photo, I think they hired high schoolers In short I must pay both subscription prices....since that is what the records indicate! I have been a subscriber to VK since the 1980s. When the app first came out I was ecstatic and disposed of all hardcopies of the magazine that were digitally available. But with the most recent release I’ve lost access to all digital versions other than the 2 most recent. When I contacted tech support, access was restored, but I’ve lost it again. I am prompted to unlock each issue to obtain ONE MINUTE of free access. To do so, I’m prompted to log in. AlthoughI am already logged in, I do so and my password is rejected. In addition, with the previous version I was able to share a few pages. This was quite convenient as it allowed me to print only necessary instructions for a pattern and to mark up the copy while knitting. Now that feature is gone. Instead when I share a page, I receive an email (essentially an ad) to download or open the app. I have never written a review before, but this App update has caused me so much aggravation I feel I must. At first i could not access any of my purchases. I tried to “restore purchases;” no luck. I also kept getting notified that my email address was not ad recognized. I emailed for help. Two days later I got reply telling me to “restore purchases.” This time the purchases made through my subscription were accessible but had to be downloaded again! The issues I’d purchases separately showed download icons; however, when tried, gave the message that it couldn’t download until unlocked. Sent another request for help; no reply after 2 days. Got tired of waiting and checked App for help. Found under FAQ directions to tap issue and then select “restore purchases.” Got another no-luck message; this time indicating it was Apple’s problem. If i hadn’t spent money on the issues and was not currently knitting something from one of the inaccessible issues, I would just give up. The new app is slick, glossy, and apparently has a great interface. Despite being able to log in on the VogueKnitting website the app is presently refusing to accept my email address. It continues to state that the email address is not recognized. Please! Fix this glitch, NOW. Long time subscribers have years of digital magazines and this long time subscriber cannot access any of them. I appreciate the reply from the developer. When I logged in to the Vogue Knitting website an update to contact info resolved the issue!!! I am, once again, a HAPPY VOGUE KNITTER!!! Edited to add: BEFORE I left this review I double checked out home internet access AND tried to use the app at work, where our access is stellar. The problem is NOT with my internet access. I have been using this app for years, and until now have had no complaints. Two days ago it updated to the new style (version 4.1), and I absolutely detest the changes. The menu doesn’t have enough information to tell you what you will be reading, and I don’t like having to flip back and forth so much to get through the content. Having said that, none of the content beyond the menu will actually load, so I’m not able to read the magazine anyway. I maybe canceling my digital subscription and going back to print. Every time this app is updated it causes a problem for subscribers. We can’t access the issues that were previously purchased (the app wants to charge for those issues). Please fix this or I will have to cancel my subscription. Update: I entered the email address as you suggested and I got the following message: please make sure you entered your email/password correctly.......I tried several times. This update should be avoided. I have lost access to all issues predating my current subscription. Please fix this and restore my previous issues as soon as possible! Also please restore the tile view of issues. It is inconvenient to scroll through many years worth of issues one at a time. I liked the layout of the interior pages a lot better the way it used to be. Now I’m not sure if I’m seeing all the patterns/articles or not. Plus you have to get in and out of the different sections which is sooo time consuming. I liked it better when it was exactly like reading a magazine. Can you change it back?! The redesign LOOKS great, but links within the magazine no longer work - seems like the pages are all just static images. Used to be you could tap on an ad or URL in the magazine and it would bring up a browser and take you there. Also should be able to click on a design and be taken to its pattern page in the magazine (and similarly, return to the design). No longer does that either. Same for continuation of an article to a page in the back of the magazine - can’t go there or return to the original article page. I was excited for an update because the old version wouldn’t give me access to the most recent editions of the magazine. That’s been fixed with the new app but now I can’t get access to any of my magazines before my most recent subscription renewal. I’ve been a print subscriber since 2010 but can only get the magazines since the most recent time I renewed my subscription (2017). 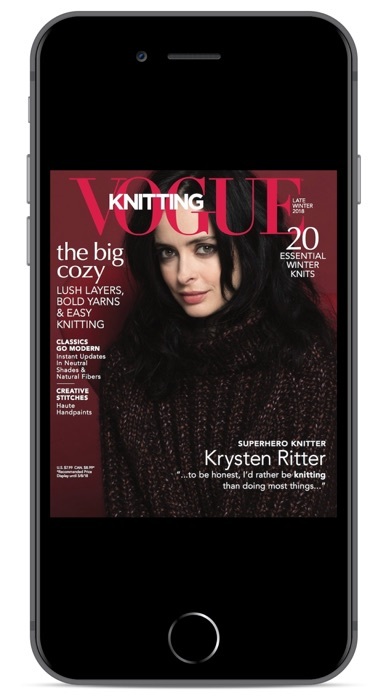 I love vogue knitting and having the magazine on my iPad. I hope you can address this issue. I want to give 5 stars. Smaller issues: I’m also disappointed that my bookmarks seem to be gone in the new version of the app and I miss being able to select from thumbnails rather than scrolling through the magazines. It is laborious to scroll through 40 magazines. I love Vogue Knitting APP. Love how I can view on my iPhone 6S. I’ve been asked why I have this big phone; to see better. 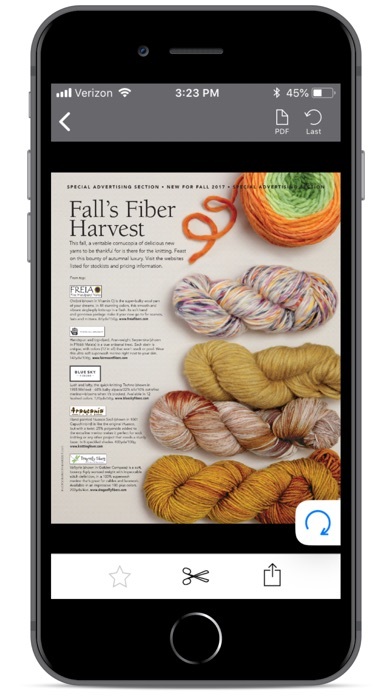 I pay directly to Vogue Knitting Magazine not through Apple. At least 6 times during 2017 I’ve had to delete & reinstall this app to view all purchased magazines. Now it’s 2018 & the same thing is happening. Please fix this Apple!!! The app was working great when I first downloaded it. As of late however none of the available issues are listed and when I try to open the issues in have purchased make the app crash every time. I have done everything that the trouble shooting list suggests. I have spent a good amount of money to have the issues available and want to continue having a good experience with this magazine. 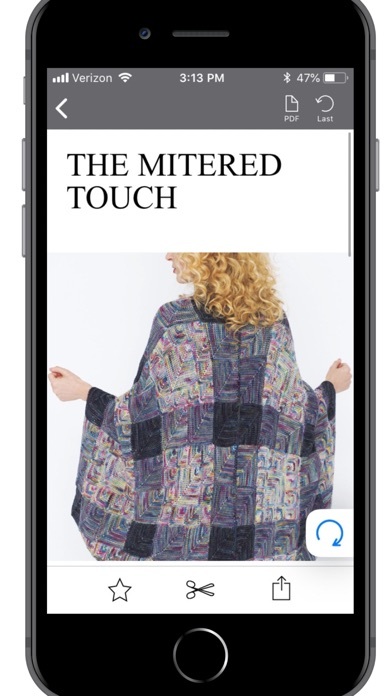 Never have I ever had to deal with a such flawed app like this vogue knitting app. Dang if I only read the reviews first like I normally do before I download any app, but I got excited to get the digital subscription that I just threw all caution out the window. Never again will I do that again. Absolutely the worst app I’ve ever seen. I don’t know who designed this app but it’s absolute junk and doesn’t work. What a waste of my time trying to figure out how to log in and it’s not working even though I made a purchase online. They have two email fields for the login form instead of a password field and it’s case sensitive. But that doesn’t really matter because you can’t recover a password or report a problem from the app. You just go in circles all day. Amateur design. Please fix this. Won’t let me log in! Like other reviewers, it won’t let me log in with my email address. Tried deleting the app before rebooting and redownloading. I’ve been trying for more than a week to get logged in. I contacted support, who ignored what I said about the error and gave me basic login instructions. Sent a screenshot of the error, we’ll see how this goes. Very frustrating app. It crashes constantly, making it impossible to use for knitting. And I agree with the other reviewers that they should allow a look into the issue so you can decide if you want to purchase it. I also would appreciate the ability to bookmark a pattern or article I want to refer to at a later date. The new app is even worse! Can’t navigate between pages not read the magazine cover to cover. Very frustrating indeed. Worthless. Hope they fix this! I’m already a paid subscriber but still cant log in after doing everything correctly. I deleted the app. Waste of my time when i could be knitting! I don’t blame the Vogue writers for this .. I blame whoever is in charge of making sure we have a decent app. This is one incredibly unfriendly. Let’s start with the login is not in any way connected to any other Vogue knitting accounts. Then, let’s move onto how unhelpful it is to look through their library and view the mags to see if one might be useful. THEN let’s move on to finding your magazine if you do make the mistake of purchasing one. There’s no “My library” or My purchases .. the only way I can find a mag I’ve bought is to look through ALL the mags and see if one looks different. THEN let’s move onto how confusing the UI is .. the mags that you have not purchased are the ones with the cloud download icon. Or, mayby you like to play Russian Roulette with the 1 minute browse time that you get to look through a mag .. whenever that may be available, who knows .. because, of course, the app tells you nothing about that. And ... 1 minute? Seriously? When you DO get a mag, well good luck using it anyway .. you cannot download it into your notebooks (which is horrible, since that is where I take notes when reading a pattern) .. I can’t even find a print button. They are so worried about their IP that they have rendered the app useless. Even though I bought a magazine, I’d rather loose it and get this app off my machine that keep the app for the one (and only) magazine that I have purchased. WAKE UP VOGUE! You’re not living in the 90’s anymore. I use to love this app - BEWARE! 9-30-17 This app crashes on start up EVERY. SINGLE. TIME. for the past 2 months. I’m paying for a magazine I can’t download, read, or even look at since the app won’t even open. Not a happy customer at this point since I can not access my magazine subscription. Fix it please. OK, I just tried uninstalling the app, rebooting the iPad, reinstalling the app BUT it will not restore my purchases. Typed my email address twice to sign in as requested. It will not allow me to log in or accept my email address. Infuriating! 12-21-17 I have tried numerous times in the past few month to get this worthless app to work. I have followed the instructions they’ve sent and IT WILL NOT WORK. I have a subscription I can open, read, or use without REPURCHASING every single publication again. This is crap! DO NOT WASTE YOUR MONEY. 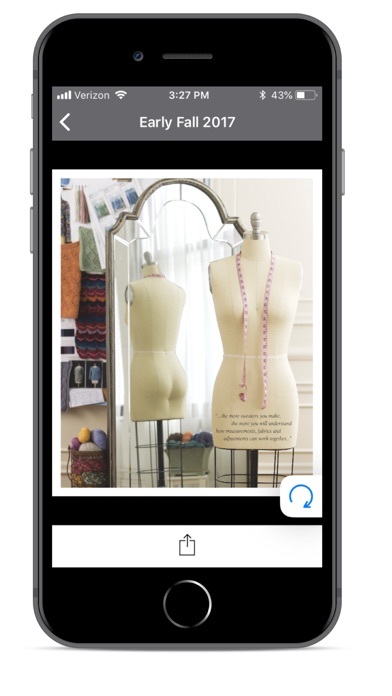 I am so angry and will be contacting Vogue Knitting again to tell them to MAIL the past and current magazines to me since this app does not work. At least in the past, I could annotate a pattern, so it was like taking a paper pattern with me. Now, I can’t. Basically all I can do is read the magazine. I’ve tried many different ways to use their export utility, but all it does is route me back to the app. Essentially the only way to get a PDF of the pattern is if you do a screenshot. The latest version is the worst! Takes forever to scroll to older magazines. Why did you even bother to change it? I have an account. I cannot log in because the system doesn’t recognize my information. I then attempt to create a new account, and I’m told my email has an account!!! This is absolutely ridiculous. November 25, 2018. Finally able to login with the help of tech support. But why bother? The interface is awful and there is NO WAY to print! Seriously? When my subscription expires I won’t bother to renew. August 1, 2018. The app was updated. Still doesn't recognize my email. Previous review... My online account knows who I am and when my subscription expires but this app won’t let me login. I just get an error message saying my email can’t be found. So I just subscribed to Vogue Knitting which is supposed to give me both paper and online issues. Not only have I not received an email confirmation (2 days now) of my order, I can’t get this app to download on my iPad Pro. It’s there, it says download, and then it won’t. Does anything work with Vogue Knitting? This latest version of the app is HORRIBLE. Gone is the convenient ‘editions’ view where you can see pages showing tiles of the magazine covers and their availability and select one. Now we have something called ‘magazines’ that forces you to scroll through the covers ONE AT A TIME (with several of them being blank because they take too long to load). There are probably about 60 magazines here. One at a time. Really? What a waste of time! I’m better off going to my bookshelf. And we can no longer scroll through the magazine. Now we must look at a menu of articles and open them, ONE AT A TIME. Are you kidding me? There’s a huge banner ad at the top of the main page. Once you’ve seen it, what’s the point of keeping it there? It just gets in the way of what you’re trying to do, which is look at virtual magazines. Especially if we already own the advertised book. It used to be a pleasure to browse through the virtual magazines on my tablet, but this is torture. Back to the hard copies! I’m trying to think of at least one positive thing to say, but honestly, all of the convince and appeal is gone. Is it possible to install an old version? VK, the least you could do is allow users to select the view that suits us so that we could use the app without it getting in the way of what we’re trying to accomplish. Please be respectful of our time. I have a current magazine subscription & the app still won’t recognize my email & zip code so I can have access to the app. VKL is coming to Minneapolis next week & I would like the app!!! This issue is out and I am unable to purchase thru App. Says cannot connect to iTunes. Please help. The Vogue Knitting app went from great to terrible since Maz took it over. Maz won’t let me access any of my purchases that I previously purchased through my paper subscription & in-app purchases, or my current online in-app subscription. This is a rip-off. I called Vogue Knitting when it started & was given a code to get access to my previous purchases. But, now, I cannot access any of my previous purchases including my current in-app subscription. Worthless piece of junk !!!! Don't waste Your money on buying this subscription like I did, As much as I Love Vogue knitting magazines, this is my first and terrible experience buying a yearly subscription, my download disappear so I follow the other review advice as to delete the app, reboot my iPad, download the app and sign in using my e-mail address. After that it asked if I want to restore my purchase I select yes but nothing else happen my purchase still doesn't show, I repeated the process 4 if not 5 times until I got frustrated without any results, the worst thing is that I didn't even get to completely view my first download magazine, I just bought this one year subscription for $20 on 8/2/17. Vogue knitting should return people their money if they can provide their service or else we are being blindly rob, because we are paying for a service that we clearly can't used. I intent to contact customer service and I will update this rate according to the results. Vogue apps on my iPad and I have purchased several of the older magazines. Since I’ve only been knitting a couple of years I missed them when the 1st came out. I have no trouble accessing them on my iPad or on the phone I had until 2 weeks ago but I can’t access them on this phone.